Preserving the properties of excellence of a typical product of the Made in Italy is possible thanks to Oleoclar, a 100% natural formulation set up by AEB. 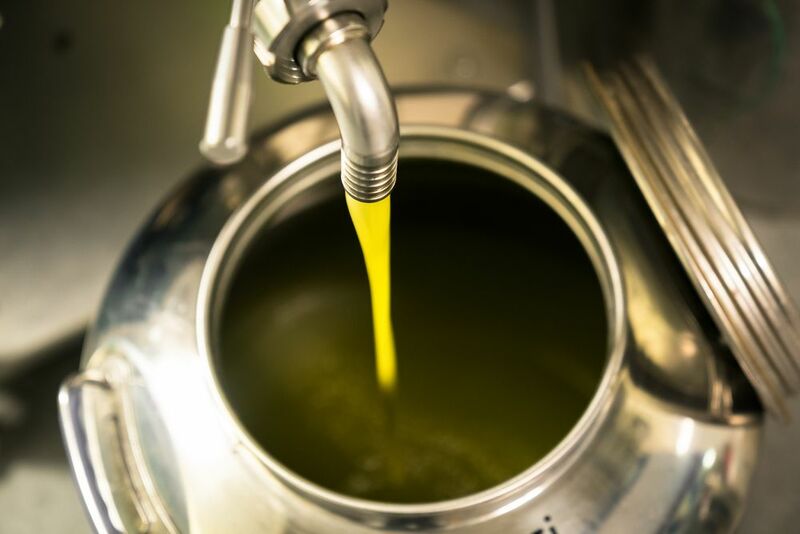 Scientific studies have confirmed that the extra virgin olive oil expresses the maximum of its characteristics at a chemical, organoleptic, nutritional and health level just after extraction that is at the exit from the decanter or separator. The ideal usage of Oleoclar as close as possible to the extraction enables to protect and to maintain for a long time the chemical-organoleptical properties of extra-virgin olive oil, preventing aroma decays and the formation of undesired smells and tastes. This 100% natural product proposed by AEB has a stabilising effect: binding indissolubly with the suspended particles, it blocks their hydrolytic and oxidant activity, protecting the oil from any alteration and degradation of the lipid and bio-phenolic matrix. Clarification with Oleoclar is performed on oil just extracted. Oleoclar is composed of cellulose and clarification agents. It is easily dissolved into oily liquids and can be directly added into the oil to be treated, homogenizing with a gentle stirring. Experimental tests have shown that the oil, just extracted and clarified with Oleoclar, is not subject to an increase in acidity, number of peroxides, extinction values in the ultra-violet. Furthermore, the content of the noble fraction of polyphenols decreases very slowly over time. All this is the consequence of the immediate removal of the degradation sources, such as lipolytic and polyphenoloxidasic enzymes. The formulation can also be used for aged oils to obtain a clean colour and improve their organoleptic properties. 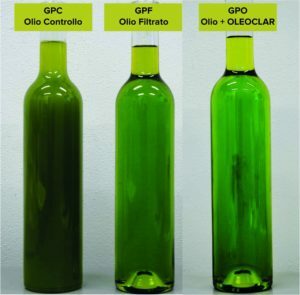 Possible applications Clarification of extra virgin olive oil: at the exit from the decanter or centrifuge separator, the oil has a high degree of turbidity caused by the suspension of a series of substances. Finely micronized water, air, proteins, enzymes, pectins, mucilages, etc., contribute to make its appearance hazy and opalescent. All these compounds are highly reactive – above all the enzymes and the watery fraction – and can start degradation processes affecting both the fatty substance and the polyphenolic fraction. The substances tend to settle on the bottom of the tanks, thereby forming in a short time a muddy deposit, commonly known as “sludge” that could compromise the organoleptic characteristics of the oil. These substances are highly detrimental to the quality of oil, and can be easily removed by clarification with Oleoclar. According to the turbidity, the suggested dosage ranges from 250 to 500 g/100 kg of oil. In case the turbidity is particularly high, it is suggested to dose up to 750 g/100 kg. The dosage can be carried out in line with suitable equipments or during the static stage, distributing the product into the common containers for oil (drum type “Milan” or in stainless steel) or into the storage tanks. The clarification is generally obtained within 48-72 hours, depending on the original turbidity of the oil, dosage and volume of the container. When the clarification has been obtained, it is necessary to separate as soon as possible the clear fraction from the sludge. Oleoclar accelerates the natural precipitation of the suspended fraction, and the so obtained clarifying effect is comparable to filtration. 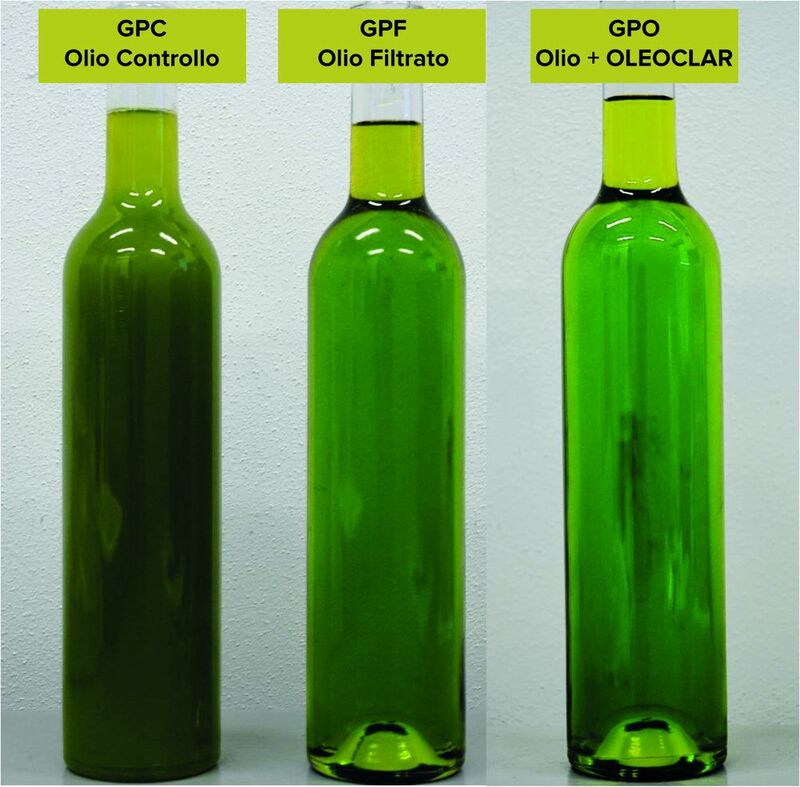 In the case of pre-clarification, Oleoclar can also be used on important amounts of extra virgin olive oil that are difficult to filter, obtaining higher performance compared to filters and consequently avoiding losses of time and waste of filtration aids.